Sorry that I have not been updating this blog for a while. No election has ever taken as much out of me as the most recent ones so I am slowly working up some more energy. There are a wide range of opinions about the above. Overall, I have been very impressed. At the General Election, I was clear that my top two priorities were to deal with the deficit and to start controlling immigration. Both of these are part of the Government’s agenda so I am pleased. A recent front page article in the Indepdent highlighted just how massive a problem the budget deficit is. I know that many people can be cynical about politicians but what I have seen are two different parties making compromises and trying to form a stable government. I believe that this Government will last. This represents a major loss to the Government. I have always found him to be very talented and perfect for the role that he was given in Government. His performance in Parliament a few days ago was brilliant. The AGM was held last week. Councillor Jagdish Sharma was confirmed as the Leader of the Council. I recognised the decision taken by most in the Borough and the Conservative Group supported his nomination. I have been impressed with the approach taken by the Labour Group, as compared to its approach between 2002 and 2006. I have found them to be very reasonable in our discussions so far. When this is the case, I will give them credit. I am adjusting to new circumstances and have gone back to my job full-time. Before the elections, I did not think I would end up where I am now but will give this my best shot. As always, representing Feltham North will come first. I will start to update my blog more regularly. Following on from the decision of Councillor Peter Thompson to resign as Leader of the Conservative Group, Councillor Mark Bowen has been chosen by the Group as its new Leader. As always, I do not forget that I am a Councillor because the people of Feltham North have given me that privilege. My obligations as a ward Councillor always remain amongst my top priorities. The role of Leader of the Opposition is a crucial one and I will do all that I can to be constructive, objective and clear. I had a voicemail waiting for me on my home phone yesterday. It was from someone stating how satisfied they were that I had lost everything in politics and was no longer a Councillor. He then laughed for 5-10 seconds and put the phone down. It is ironic how such negative feedback can cheer one up! Yesterday was a very proud day for me. 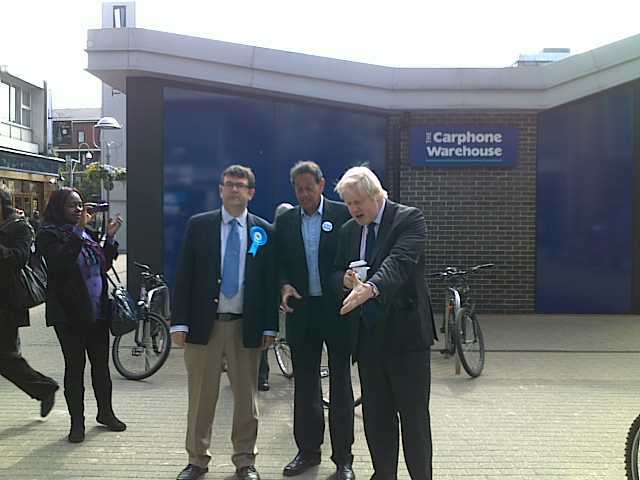 Theresa May came to Feltham in the morning and we went round parts of Feltham North. In the evening, the Party held a rally here in Feltham at the Assembly Hall. I stood ten feet tall when David Cameron congratulated the team on a energising campaign. It was a moment I will not forget. Another high profile Guest comes today. Exciting times and all to play for. Back to the campaign!